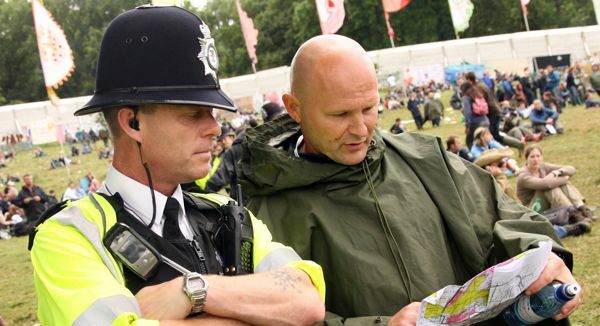 The Police have been present on the Festival site since 1989. The Festival is a town in its own right, and the town needs policing. The Police HQ is located at the top of Big Ground, near Worthy FM. Please report all crime. Only food and alcohol for personal consumption can be brought into the site. You may be searched at the entrance for any items that may be used in an illegal or offensive manner – which will be confiscated. Persons suspected of carrying out illegal and/or offensive activities on-site may also be searched and face eviction. No portable laser equipment or pens are permitted. No animals (except registered guide dogs), sound systems, generators, sky lanterns or kites, unauthorised fireworks, wax flares, large fires or burning of plastic will be allowed on the Festival site. Persons using fireworks will be evicted from site and materials confiscated. No unauthorised tape recorders, professional film or video equipment are allowed on-site. Cameras for personal use are welcome. Ticket holders consent to the filming and sound recording of themselves as part of the audience. CCTV will be used on site. Images will be monitored for the purposes of public safety, crowd management and crime prevention. For further information, contact Site Office, Worthy Farm, Pilton, BA4 4BY. The cost of the ticket includes camping (apart from Sunday tickets), musical and non-musical performances. Head to glastonburypolice.org for the official website of Avon and Somerset Police’s Festival team. Increasing the number of police officers in the surrounding towns and villages before, during and after the Festival. Setting up temporary police stations at Pilton, Pylle and West Pennard. Working out a traffic plan with diversions to cover a wide area, so that non-Festival traffic is signposted away from the busiest areas. Hiring the Royal Bath and West Showground as a support base for our custody centre and vehicle park for the towaway scheme. Building a police village on the Festival site for our enquiry office, communications and command centres.